Public service - THE service: Benefits - means to an end, or end in themselves? It's tremendously easy for a project to take on a life of its own and for the benefits to follow the project, rather than tying the benefits to the organisation or programme strategic aims and forcing the project to maintain its link with the benefits. Benefits realisation is often facilitated/ managed by someone not directly working with service users. 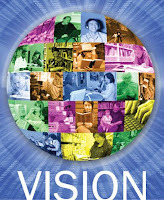 Have a look at an aspirational vision statement - "we will reduce or eliminate inequalities in healthcare by 2012". In order to make this achievable, it needs to be broken down into specific milestones and specific steps, though in fairness the vision statement was never meant to go into this level of detail. Vision statements, or even the desired outcomes that make them up, don't mention the enablers. I don't remember a single vision statement for a hospital or primary care trust - the care providers - that talks about IM&T or worksforce, no mention of (for example) the shared electronic patient record, or more advanced practitioners to do the work. This makes it easy for the goals of the projects themselves to become disconnected from the overall aims of the organisation. This means that you need to define or find tangible, measurable, time limited (milestone) sub-goals or sub-outcomes which feed into the main outcomes, with each sub-outcome contributing to one or more outcome but often with a number of sub-outcomes contributing to any particular strategic outcome. Define them in tangible terms (SMART? ), and break them down further. The discipline of drawing Benefits Dependency Networks (BDN) is valuable here. The BDN illustrates what benefits you expect to achieve, and what project is dependent on which other. With finite and limited resources, you need to know what to prioritise - very often enabler projects such as IM&T don't deliver end-user facing benefits, so it is easy lower the priority on these. However failure to deliver enablers at the right point in the project timescale mean other projects cannot deliver their benefits. Review your project. Which benefits as defined above does it contribute to (and which was it set up to contribute to)? What else is it delivering besides the sub-goals or outcomes defined above? How much resource is being put in solely to deliver these ancilliary goals? Should you be doing this? When developing new roles in the NHS Modernisation Agency, often the original driver for developing the roles had been "forgotten" in the course of pursuing an exciting project - the new role began answering questions and needs quite different from those originally envisaged. If this is the case you will come a cropper when the day of reconning comes! So focus on the original aims and treat all other successes as secondary - great in addition, but no substitute.